Agriculture: In addition to other characteristics, template 57236 is designed with the following in mind: design must emphasis the study or the practice of agriculture. 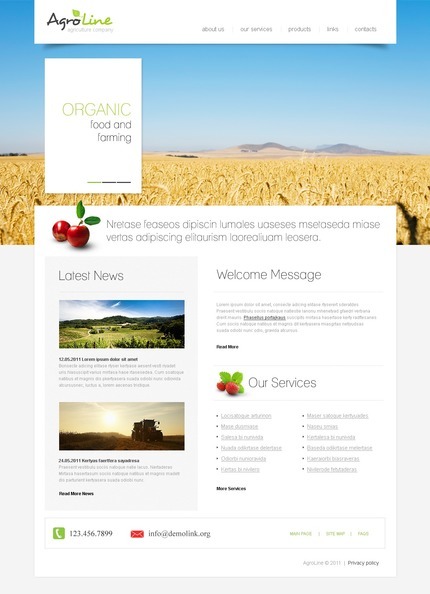 Agriculture PSD Templates are a great choice for websites presenting farms, food production and related agricultural subjects. Bonus with every purchase With each template purchase you get Free Web Design Elements: photos, fonts, icons, 3d models, sounds. Buy template 57236 from zeronese today and get access to the Free Clipart & Free Web Design Elements library.